The subject of mathematics is not something distant, strange, and abstract that you can only learn about—and often dislike—in school. It is in everyday situations, such as housekeeping, communications, traffic, and weather reports. Taking you on a trip into the world of mathematics, Do I Count? 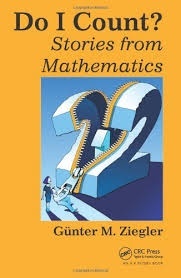 Stories from Mathematics describes in a clear and captivating way the people behind the numbers and the places where mathematics is made. Written by top scientist and engaging storyteller Günter M. Ziegler and translated by Thomas von Foerster, the book presents mathematics and mathematicians in a manner that you have not previously encountered. It guides you on a scenic tour through the field, pointing out which beds were useful in constructing which theorems and which notebooks list the prizes for solving particular problems. Forgoing esoteric areas, the text relates mathematics to celebrities, history, travel, politics, science and technology, weather, clever puzzles, and the future. Can bees count? Is 13 bad luck? Are there equations for everything? What’s the real practical value of the Pythagorean Theorem? Are there Sudoku puzzles with fewer than 17 entries and just one solution? Where and how do mathematicians work? Who invented proofs and why do we need them? Why is there no Nobel Prize for mathematics? What kind of life did Paul Erdős lead? Find out the answers to these and other questions in this entertaining book of stories. You’ll see that everyone counts, but no computation is needed.